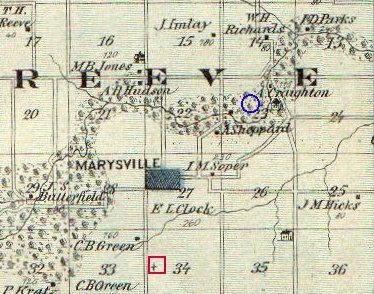 The Maysville Cemetery is represented by the RED SQUARE on the map. Over 25 stones have been found under the sod, next to trees or out in the timber and have been restored and reset to as close to their original locations as possible. Work continues on the Maysville Cemetery. The Towle Cemetery, also known as the Reeve Township Cemetery, the Jones Cemetery or the East Maynes Grove Cemetery is represented by the BLUE CIRCLE on the map. This cemetery was the first burial ground in Franklin County. A rock east of the cemetery denotes the site of the first school house in Franklin County. The records on this cemetery are sketchy at best. Many of the stones are broken and have fallen down. Work on this cemetery will start after the Maysville Cemetery is completed.